Courtyard House, Aurora, Oregon. New prototype. With the disintegration of the traditional nuclear family as the dominant spatial fabric in the twentieth century, a new typology for family life is needed for the post-sprawl city. The Courtyard House re-conceives low-density metropolitan living by concentrating the detached single-family residence into a semi-urban courtyard structure, thus fulfilling the new demands of a dispersed aging population. By utilizing a marginal urban in-fill site, and by eradicating the traditional room and corridor plan, the Courtyard House sponsors more collective and ecological forms of life without sacrificing the necessary privacy of daily living. Critical to the conditions of the project was the client’s wish to harmoniously “age in place” with nature, while being connected to an urban community. In addition, the client wanted a solution that would allow them to “deaccession” their lives, to reduce their accumulation of things. Functionally, the solution was simple: a single level, open structure that would be accessible, easy to live and age in, and maintain. In response to the demand to live harmoniously with nature and community, the Courtyard House is conceived as a canopy structure: a single volume framed between a cantilevered concrete slab below and a roof “umbrella” above. Piercing the center of this single volume, is a faceted glass exterior courtyard that introduces nature into daily life. Entered through a sunken patio, the house flows in a continuous loop around two L-shaped storage cores, while a stepped glass and concrete envelope negotiates transparency and privacy to the neighboring context. A matrix of rooms separate and connect around the L-shaped bathroom and storage cores made flexible by concealed doors at their ends. Because no room is compartmentalized and isolated as in a conventional home, every room can be an active space during the day and a sleeping space at night. Maximizing usable space while minimizing poché, each storage core contains all of the rituals of daily living—toilets, showers, closets, mechanicals and the kitchen—allowing each room to be equipped communally when open or privately when closed. The Courtyard House is excavated into the hillside to optimize views and solar access, allowing light and air in, while sinking the structure into the earth to maximize thermal insulation. In the wintertime, the courtyard’s position increases the passive heating of the sun, while in the summertime, shaded by native deciduous trees, the courtyard stimulates natural ventilation and passive cooling, eliminating active AC. As a single level of interconnected accessible spaces, the Courtyard House nurtures inter-generational family life, framed by nature: a gentle entrance ramp and exterior covered terrace, negotiable for wheelchair, walker, or stroller, connects inside to out. Similarly, the kitchen replaces daily overhead cabinets with large drawers to directly connect sink and dishes, while the showers are curb-less and roll-in. Set on an urban in-fill lot at the edge of a terrace escarpment overlooking indigenous wetlands and a wild river, the Courtyard House weaves between natural and urban contexts. While the house is invisible from the main street, a short five-minute walk connects the residents to the town center and every community amenity. The same walk also provides access to downtown Portland via public transportation. $215/ sf. Concrete, glass, steel, Douglas-fir mullions, Douglas-fir glulam beams. Unlike a conventional structural box with four contiguous shear walls, the two L-shaped storage cores are split apart by the exterior courtyard, creating lateral bracing that carves the loft-like space into alcoves. A series of cantilevered roof beams, supported by 3” diameter pipe columns, create a canopy structure. Like an outstretched umbrella, the canopy structure creates an open gesture for greater social conviviality, while at the same time, invites the natural world in. uploaded The Courtyard House through Add A Home. Set on an urban in-fill lot at the edge of a terrace escarpment overlooking protected wetlands and a wild river, the Courtyard House weaves between natural and urban contexts. Permeable pavers harvest rainwater for the native landscape. While the house is invisible from the main street, a short five-minute walk connects the residents to the town center and every community amenity. In response to the demand to live harmoniously with nature and community, the Courtyard House is conceived as a canopy structure: a single volume framed between a cantilevered concrete slab below and a roof “umbrella” above. View from the accessible terrace. Piercing the center of this single volume, is a faceted exterior glass courtyard. The faceted exterior glass courtyard introduces nature into daily life. Entered through a sunken patio, the house flows in a continuous loop around two L-shaped storage cores. A stepped glass and concrete envelope negotiates transparency and privacy to the neighboring context. A matrix of rooms separate and connect around the L-shaped bathroom and storage cores made flexible by concealed doors at their ends. Because no room is compartmentalized and isolated as in a conventional home, every room can be an active space during the day and a sleeping space at night. Maximizing usable space while minimizing poché, each storage core contains all of the rituals of daily living—toilets, showers, closets, mechanicals, and kitchen—allowing each room to be equipped communally when open or privately when closed. A continuous curtain track changes spaces from open to closed. 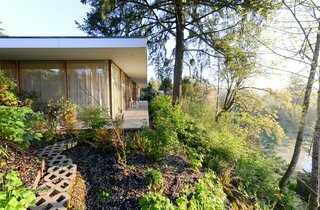 The Courtyard House nurtures inter-generational family life, framed by nature: a gentle entrance ramp and exterior covered terrace, negotiable for wheelchair, walker, or stroller, connects inside to out. The kitchen replaces daily overhead cabinets with large drawers to directly connect sink and dishes, while the showers are curb-less and roll-in. In the wintertime, the courtyard’s position increases the passive heating of the sun, while in the summertime, shaded by native deciduous trees, the courtyard stimulates natural ventilation and passive cooling. The Courtyard House is excavated into the hillside to optimize views and solar access, allowing light and air in, while sinking the structure into the earth to maximize thermal insulation. Unlike a conventional structural box with four contiguous shear walls, the two L-shaped storage cores are split apart by the exterior courtyard, creating lateral bracing that carves the loft-like space into alcoves. A series of cantilevered roof beams, supported by 3” diameter pipe columns, create a canopy structure. Like an outstretched umbrella, the canopy structure creates an open gesture for greater social conviviality, while at the same time, invites the natural world in.